Adding new mobs in the MCPE - not an easy task. However, with a new Techne tool, created by MyNameIsAnti, BagasMC has ported a Guardians from PC version in Pocket Edition 0.11.1. This underwater mob, which at the moment can spawn using Guardian spawn eggs. Mob will not attack you, but he has a special skills for the battle. 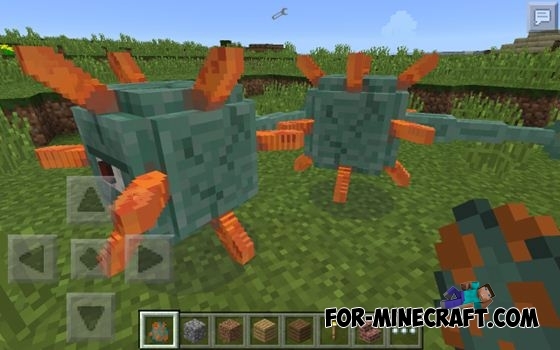 Guardian mod for Minecraft PE 0.11.1This mod adds a guardian from the PC version of the game! Secret Mobs in MCPE 0.11.0The new 0.11.0 beta version has hidden features. Legendary Weapons (LW) v2.0 for MCPE 0.10.5The second version of the new and increasingly popular addon - Legendary Weapons by 1x3y5.